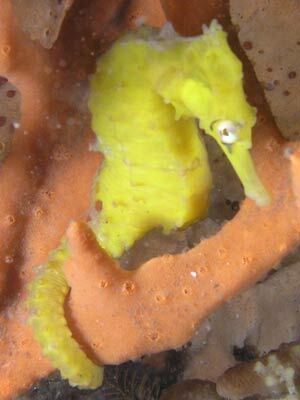 In other articles on this web site, I have described dives at my favourite shore dive site, Bare Island and the location I have dived most (as of July 2006, more than 175 times). 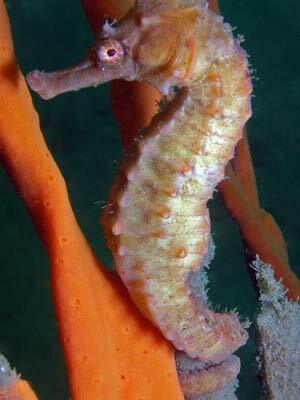 In this article I will describe another dive that you can do at Bare Island. 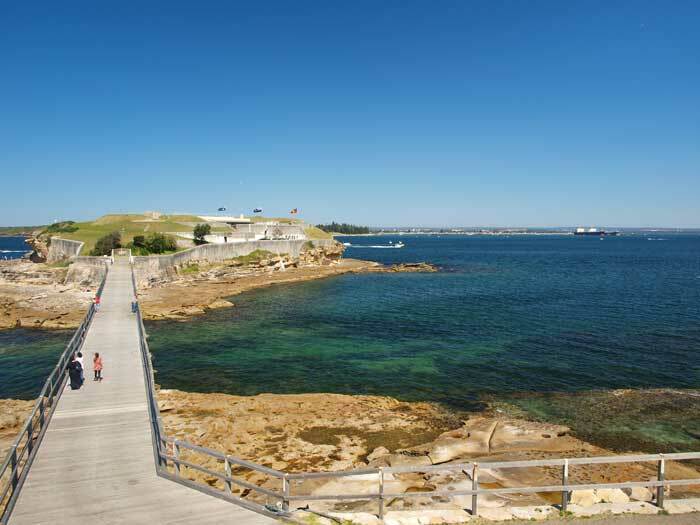 Located 20 kilometres from the centre of Sydney, Bare Island is part of Botany Bay National Park. 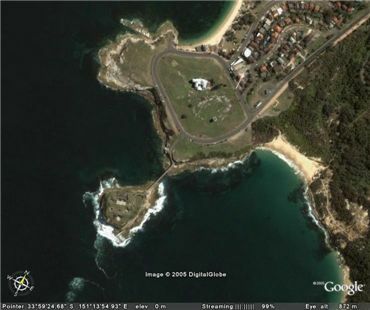 From the city, travel along Anzac Parade or Bunnerong Road to La Perouse. Upon arriving at La Perouse, park on the edge of Anzac Parade above the island as close to the island's access road as you can. Walk to the edge of the headland overlooking the island to check the water conditions as well as the entry and exit points. This dive can be done in virtually all seas, even those from the southeast. I have dived here many times when surfers have been surfing off the eastern end of the bridge that joins the island to the mainland. It is only in the hugest of seas that you cannot dive this site. One thing that can affect the site is that after prolonged periods of very heavy rain, the visibility can be reduced to one or two metres. If you asked me back in the mid-1990s I would have said that even at its best, the visibility only got to four or five metres. However, since about 1999, visibility here has improved dramatically. The visibility has averaged almost 10 metres on these dives. It is certainly much better than the previous 13 years. In May 2003 I dived here and had 15 metres and on 13 December 2003 at least 15 metres. 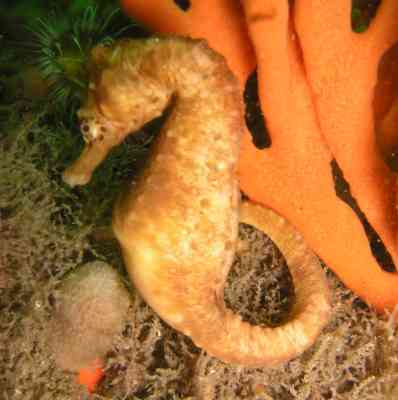 Since then I have had a couple of 20 plus metre viz dives amd on 7 May 2006 it was about 30 metres above 14 metres. The tides do not really have much impact on a dive although sometimes an outgoing tide can cause a current in the deep section of the dive. Visibility is sometimes better on high tide but I have also had good visibility at low tide. This dive begins on the island. Gear up and walk across the bridge and climb down the newish stairs and go under the bridge. Normally I enter the water near the small boat launch ramp cut into the rock platform. If it is very calm, I walk right out to the westernmost point of the island and enter here. However, until you have a bit of experience of this dive, start at the boat ramp. This starts at the boat ramp mentioned above. Enter the water and drop to the bottom. It is about three metres deep. Head to the north-west and you will gradually get deeper. After 15 metres you will go over a small reef. Turn to your left and head south-west across the sandy bottom. After about five minutes you will reach the main reef. As you go you may see things like large flathead, numbray, small rays and flounder. The depth will be about five to six metres on the sand. Where you meet the reef (Point A) is the main section of the reef and you should follow the edge (on your left) as it goes first north-west and then west. Keep to the main higher reef and you will sort of swim through a gutter (large whitish rocks on left and a "wall" of kelp on right) with a flat rocky bottom. After about 25 metres you will cross over onto sand. The reef continues on your left and turns a little to the south-west. In March 2001 while diving in this area, I saw four huge flathead on the sand here. Another 25 metres further on a sandy finger runs to the left into the reef (depth 8 metres). This finger goes off in a south-westerly direction while the main reef goes west. In poor visibility this can cause confusion and cause you to move away from the real edge of the reef up onto the top of the reef. Care needs to be taken as this leads to an area where you can get lost and not easily find your way back to the reef edge. If this occurs, head in a northerly direction until you regain the sand. Near this location there are some large boulders out on the sand. In this area at about 8.5 to 9 metres, there are some orange sponges on the isolated rocks off the main reef. 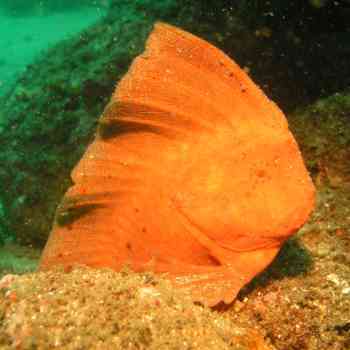 In this area there is often red Indianfish, we have been seeing them on this dive nearly every dive since about 2004. See the photo towards the bottom of the page. All along here there is a very prominent wall with then bits of reef or isolated rocks located off the wall. There are also lots of old bits from the bridge (pylons and decking) and even part of a powerboat. Examine the rocks, the overhangs, the (normally dead bits of) kelp on the sand. You will find some amazing fish here. We see pygmy pipe horses in this area as well, although you need to look very carefully to find them. They can be brown, bright red or even white. We have seen one with a silvery stomach. 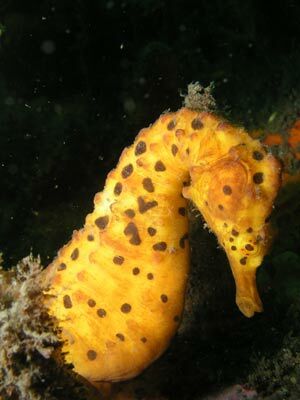 There used to be three big belly sea horses on the sponges on the isolated rocks at about 11 to 12 metres. 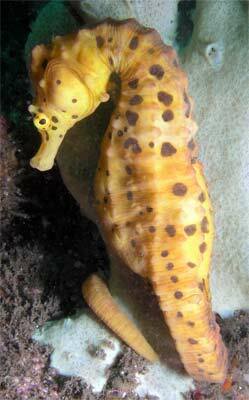 We call this Sea Horse Rock. Look for a rock that has the top in about 12 metres at mid-tide. On the eastern side of this rock there is a long piece of pylon from the bridge (narrow diameter but long) lying across your route and another fatter (about 0.75 metre diameter and 1.5 metres long) piece that lies facing parallel to the wall. On the western side of this rock there were three sea horses. I first saw one of them in March 2003 and found the others soon after. 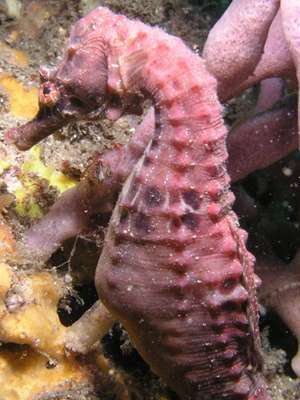 The original sea horse appeared on 12 November 2003 to be "pregnant". 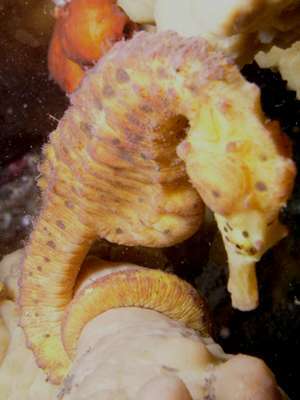 The second sea horse was very pregnant on 26 December 2003. 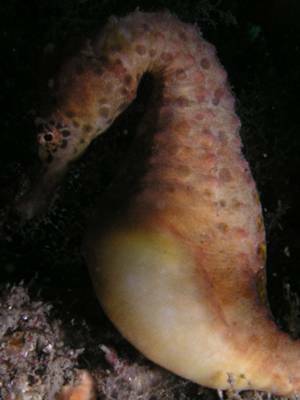 However, it was not pregnant as of 4 January 2004. 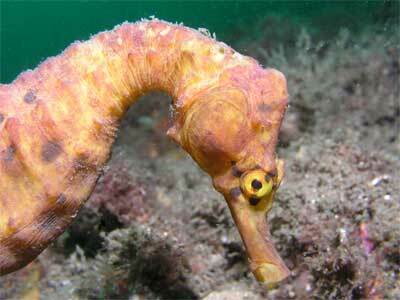 There was another sea horse here as well. 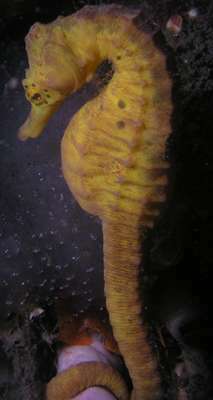 All these sea horses were fairly easy to distinguish, as they have some quite unique markings. See the table below for details of sightings as well as some photographs. There were there for about three years till early 2006. 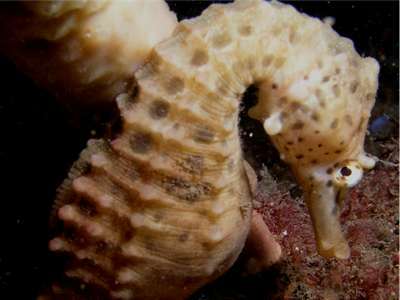 However, in January 2006 the last of the sea horses was seen. They are now all assumed to be dead. 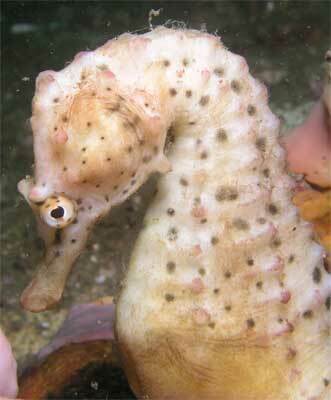 In January 2007 on a night dive I found a pygmy pipehorse living on Sea Horse Rock. It was tiny, only 10 mm long. I successfully refound it on a day dive three days later. It was much harded to see on this dive, even in some of my photos I cannot see it! It was here many times in January 2007 but on 7 February 2007 I could not find it. 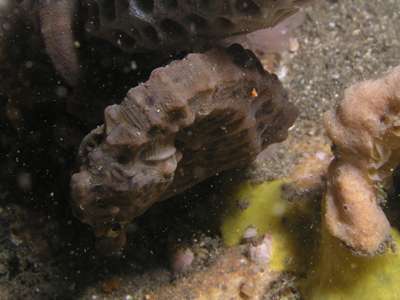 It was located just behind the yellow sponge next to the orange finger sponge on the north-western corner. A pygmy pipehorse on Sea Horse Rock Can you see the same pygmy pipehorse? Past here the wall turns a bit more to the north-north-west and drops a little to 13 metres. There are lots of large and small boulders off the wall. All along this section the used to be sea dragons. These can be found on the sand interspersed with the kelp. Look around the rocks and in and under the kelp that sometimes accumulates here. However, since 2009 we have hardly seen any. As well, there are often huge flathead to be found. These can be as long as your arm and even if you do not seen one, you may see the indentation in the sand where one has been lying. There are also many large octopus to be found under the boulders. In summer you will often find firefish in this area, I have seen five on one dive. We nearly always see red Indianfish in the dead kelp at about 10 metres. The depth keeps increasing till you get to 14 metres or so. 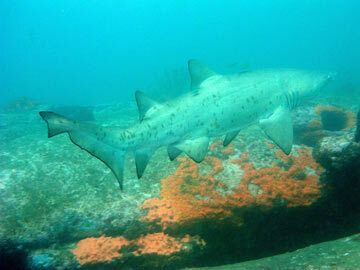 Just past Sea Horse Rock I found a grey nurse shark on a dive on 18 April 2007. 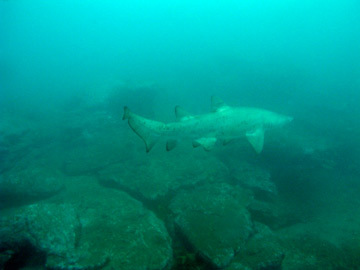 The shark was a small female, a bit over 1.5 metres long. She came in while I was taking photos of a small sea dragon and swam over to the wall, went up the top and to the west. She then came back to the bottom and went back east and then up over the reef top and disappeared to the south. This was the first grey nurse shark I have seen at Bare Island but I have seen them on the southern side of Botany Bay at Inscription Point and nearby. 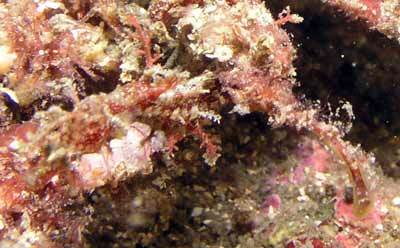 We see pygmy pipehorses (they look like tiny sea horses) hidden in the red weed in this for many years. Look for weed that moves out of sync with the current. Another way to find is to move your hand a few millimetres above the weed and watch for anything that moves trying to avoid your hand. About 20 minutes of exploration from the start along the main sand edge (basically travelling due west) will bring you to a location where the rocks off the wall have been left behind. 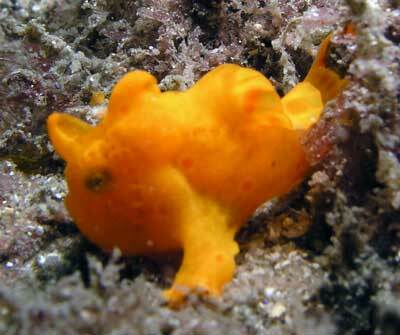 On a small rock just off the main wall in August 2006 a friend found a tiny, 15 mm long, orange anglerfish. See the photograph above. 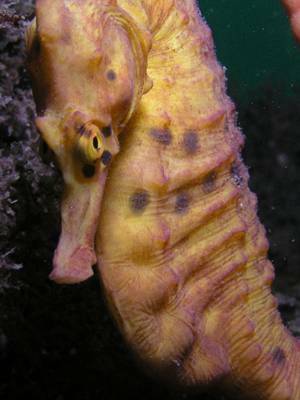 This is the cutest fish I have ever seen, ever nicer than a pygmy pipehorse. In the second quarter of 2016 we saw as many as three tiny anglerfish here, two orange ones (10 and 15 mm when we first saw them) and a black one. 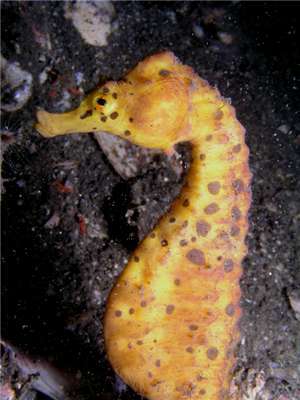 Just past here I found a sea horse on 26 January 2008. This was on one of the rocks about 10 metres off the wall. Continue west and stick to the main wall rather than the rocks when the lower part of the reef heads off in a north-west direction. When the lower part runs off there are a few small boulders on the sand away from the main reef. There used to be more but they have been covered in sand for a couple of years. You should visit the rocks on your return trip. About 20 metres on there is a low but deep overhang. This is hole to lots of fishlife, and in August is normally full of Port Jackson sharks. A bit further along and deeper there is another larger and deeper overhang (Point B). The depth is about 14 to 15 metres. 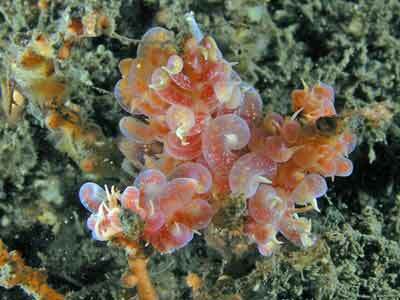 Inside you will find heaps of colourful marine growths including gorgonias. A resident blue groper can often be found in the cave as well as the usual cave dwellers like estuary catfish, Sydney cardinalfish, yellow banded sea perch and half-banded sea perch. Outside the cave on the rocks there are sponges of all colours as well as giant ascidians, lace coral and Bairds solitary coral. You will have noticed these for the past 50 metres or so. Go a bit further along and you will see a crack with some sea tulips above. These have some fantastic things living on them. What are they? 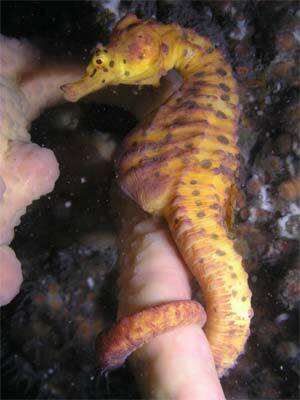 More big belly sea horses. 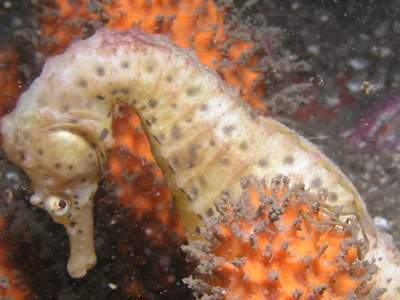 I was told that there were three but on 11 July 2004 when I first found these sea horses, we found four. 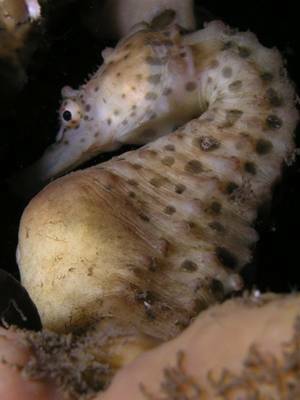 There were at least six separate sea horses living here in 2004 to 2005 but by late 2005 I could only regularly find two. Sometimes they could be about five metres further on under a low overhang or less often on the top of the overhang. We call this Sea Horse Corner. However, since about 2010 we have seen none. 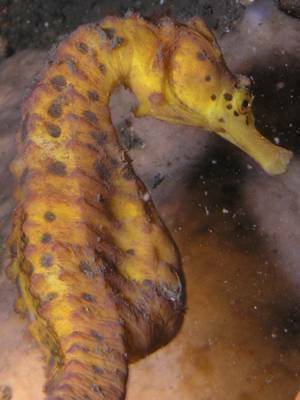 Note that if you go to the right (west) from the corner, there are sometimes sea horses on the orange sponges about 10 metres along. From 26 January 2011 till at least 3 July 2011 there was a bright yellow Whites sea horse and a pale yellow Whites sea horse in this area. This is about as far as you will get, especially if you are less experienced. 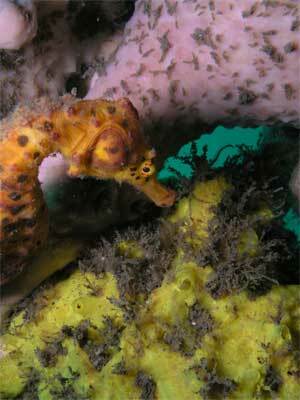 Before heading back, check out the boulders and reef in front of the Sea Horse Corner. At night or in very poor visibility, do not stray too far as you will end up running into the start of Isolated Reefs and can easily get lost. This table shows a record of some more sea horses seen at Bare island. If you follow the reef edge past the cave, the main part of the reef turns a bit to the south-west until it becomes less distinct. See later for a description of turning continuing west. On an outgoing tide you may feel current taking you to your left (south-east). It should not get too strong. If you drop a little deeper, there are a number of smaller rocks on the sand. 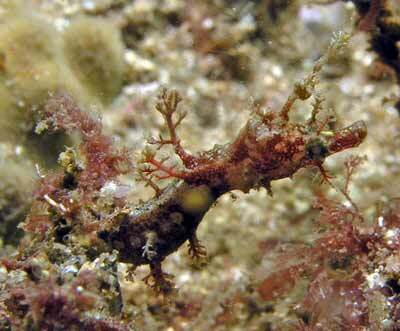 Have a careful look around them and you should see a few common sea dragons. On one dive here in 2002 I saw six. The depth is about 16 metres. If this is your first dive here, it is probably best to turn around here and follow the reef back to your starting point. The following is a table showing my sightings of sea dragons on the right side of Bare Island. This includes Bare Island Deep Wall and Bare Island Isolated Reefs. Numbers seem to peak in Winter and are at their lowest in Summer. This is a first, showing that sea dragons may move long distances. 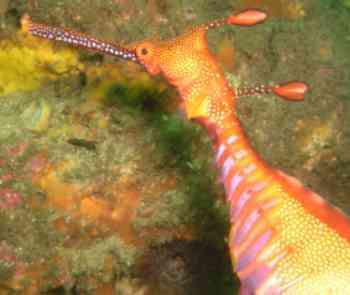 For more information about sea dragons, see my Sea Dragon Page. Once you reach the spot where you met the first reef (Point A), take a heading of east and follow it for about five minutes. Make sure you are gradually getting shallower. On the sand you can often see flathead, stingarees and numbfish in this area. Eventually the water depth comes up to two metres and you should have seen some kelp covered low rocks. Exit at the boat ramp, but if you run short on air, you can exit anywhere along the reef after you have passed the point mentioned in the paragraph. An alternative exit if you have air is to head north-east from Point A for over five minutes. Once you reach this area head due north until you strike the northern side of the channel between Bare Island and the mainland. If you still have air, you can loiter in this area for a while until you follow the new reef towards the bridge. On a good day you can see the bridge from under the water and you can exit anywhere to the immediate west of it. An alternative is to swim under the bridge to the eastern side and exit there. This will, to some extent, depend on the prevailing seas. Once you are more experienced, try out the deeper dives on the right side of Bare Island. There are two, the Isolated Reefs and the Deep Wall. A list of commonly seen (and rarer) fish, sea dragon sightings and warnings are on the Bare Island Right page.